Gazing balls, also known as gazing orbs, have been incorporated into both formal and informal gardens for centuries. Gazing balls are typically seen tucked alongside pretty flowers and fountains or grouped together as an artistic garden feature. Gazing balls come in so many colors and styles that they suit just about any garden setting, from rustic to elegant and everything in between. Here are a few ways that you can incorporate a gazing ball into your outdoor space. 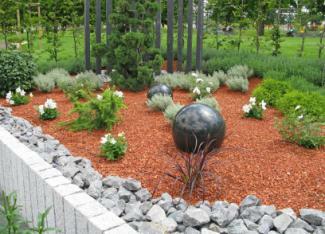 Gazing balls add height, texture, color and interest when tucked alongside flowers in your garden. Pick a stand and ball style and color that best suits the garden where you wish to place the ball. Be sure that you accommodate for the mature size of your plants. You do not want the plants to hide the ball, but they look lovely hugging the stand or hanging behind the ball. 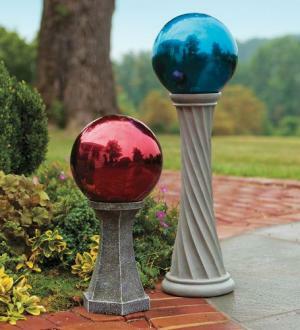 Several different sized gazing orbs grouped together make a dramatic impact on any garden space. 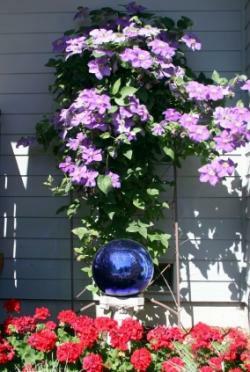 Purchase stands in varying heights and choose ball colors that coordinate with your existing landscape. Place balls in a location where they will be most enjoyed. Use a low voltage spotlight so your gazing ball group can be enjoyed when the sun goes down. Gazing balls and water features complement each other nicely. Frequently seen together, this pair makes a stunning display in any garden setting. The light and water reflect off of the ball and produce a dramatic effect that adds to the beauty of the ball. 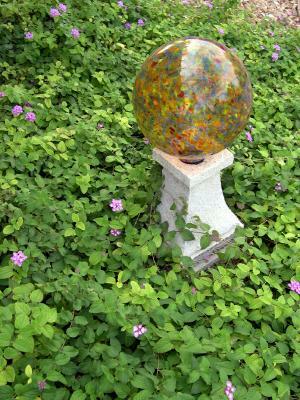 If you have room, place a couple of gazing balls next to your pond or fountain and landscape around them. Smaller versions of pedestal sitting gazing balls, known as faerie balls, hung from trees adds a dramatic effect to any outdoor space. Hang several of these smaller balls from heavy wire and hooks from a sturdy branch. Placing an uplight on the balls will allow their beauty to shine at night. Welcome guests to your house with a beautiful gazing ball perched on an artistic stand. If you have enough room, place one on either side of the door. Be sure to place the balls far enough away from the door so that they will not get accidentally knocked off of their stands. Gazing balls are easily incorporated into, and can be used to help define, particular unique garden themes. The type of ball that you choose and how you display your ball will convey your chosen theme. To make your rustic garden really shine, try placing three or five glass gazing balls of different sizes and colors into a rusty old wagon and setting it in your garden. This creative mix of country pops when you add the gazing balls to the wagon. Other props, such as old farm equipment or even garden tools, are easily embellished with gazing balls. Place an old pitchfork in the ground on an angle and set a rusted red gazing ball at the bottom of the fork for another eye-catching garden display. The key to using gazing balls in a rustic or country themed garden is to think outside of the box. Look around for old milk crates, tools, boxes, old bird baths, and other props to use with your gazing ball and forego the "traditional" pedestal arrangement. The original use of gazing balls began in a formal fashion. Gazing balls are quite at home in any elegant garden setting. In a formal garden setting, it is important to pay attention to selecting a refined pedestal and making your gazing ball or group of balls a focal point. When placed in a group, the balls will have a more dramatic effect. For a modern and elegant feel, try using copper or bronze balls. When placed next to a reflection pond or incorporated into garden sculpture, gazing balls add a fresh edge to any formal garden. Gazing balls add a dramatic impact to any tranquil Zen garden setting. The cool metal of a polished silver gazing ball blends well with the natural elements in the garden and can be placed directly on pebbles or rocks in a medium to large garden or on a tray in a small garden. Try filling a metal tray with a little bit of water and placing a silver or copper gazing ball in the center of the tray for a dazzling centerpiece in your Zen setting. The key to a Zen garden is simplicity; try to avoid groups of gazing balls or bulky stands. When looking for a gazing ball, you will have plenty of options. Most gazing balls are formed from hand-blown glass, although some are now constructed of shiny steel. Sizes vary, but generally range from 4 to 12 inches. Gazing balls come in all colors of the rainbow and have a sealed end to keep moisture from entering and to protect the color. Gazing ball stands are traditionally made from concrete but are now made from wood, metal, and wrought iron,and can be simple or extravagant. Shop for them at a local landscaping company, home improvement store, garden store, or online. If you are after a handmade gazing ball that is 100% original, visit Kugglehouse.com. You will find a wide assortment of colors and sizes, as well as designer stands. Kugglehouse offers a 100% product guarantee return policy. The site is a little difficult to navigate, but this is offset by the fact that all of the gazing balls are handmade, not factory made. If you are looking for an authentic work of art, this is a good place to shop. A cute orb that is actually a solar light. This gazing ball has a cracked glass globe and changes colors using stored energy from the sun. Ideal for decks, patios or petite garden locations, this solar gazing ball joins the traditional with contemporary for a fresh look and feel. 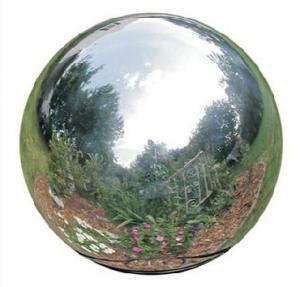 This stainless steel ball is the perfect match to your quiet garden retreat and can be displayed in any number of ways. For those who like the way the colored glass balls look, there are plenty to choose from at Amazon. You can also find simple stands, or more elegant contoured specialty stands. Amazon is a reliable shopping site with reasonable prices and shipping terms, especially if you are a Prime Member. This reasonably-priced website offers a number of different colored gazing balls including glass, steel and hanging balls. Collections Etc. is a popular shopping site for all of your garden decor needs and often has great sales and clearance prices. Although you will not find nearly the variety of gazing balls here that you do on the Amazon site, the prices are great and they carry unique items, such as the set of whimsical gazing balls birds pictured here. The site is easy to navigate and you can check out with PayPal. Shipping averages around $7 and they do charge a small processing fee on top of this. You will find every size and color of gazing ball imaginable on this site. The Gazing Ball Outlet also offers a number of holding racks and stands. Gazing ball prices start around $27 and range up to $100, depending on size, style, and quality. An added bonus of this online gazing ball retailer is that they offer free shipping all over the United States. The site offers plenty of information on each ball and a quick and painless checkout procedure. Gazing balls are highly fragile and care must be taken when setting them up or moving them. Make sure that you place the stand on a level surface, smoothing it out with a rake if necessary. Take care not to knock into the stand while working in your garden. If you expect high winds or other severe weather, it is best to store your gazing orb in a safe place. For those in the northern regions, it is a good idea to store your gazing ball inside for the winter. Gazing balls are versatile and dramatic, and make an impact on any space that they occupy. No matter where you place your gazing ball or a group of gazing balls in your outdoor space, you are sure to enjoy their presence.